Colchester beat promoted Brentford to all but seal their League One status. Colchester's Marcus Bean bundled in Brian Wilson's free-kick before Alex Wynter powered home a fine header. Freddie Sears scored from the spot to make it 3-0, after Alan McCormack had fouled Sanchez Watt. Brentford pulled a goal back when Stuart Dallas lashed in from 20 yards but Sears restored Colchester's three-goal cushion after he thumped into an empty net. "At times I thought we were magnificent today. Tactically we were great. It would be nice to see some more it, as a manager that's what frustrates you because I know what my team is capable of. "I think the players deserve a lot of credit today against a top side. They came here and picked their best team." "That kind of effort and that kind of commitment at this stage of the season was incredible. "We've got a lot of injuries from it, but somebody once said about leaving everything on the battlefield and we did that today." Match ends, Colchester United 4, Brentford 1. Second Half ends, Colchester United 4, Brentford 1. Attempt missed. Sanchez Watt (Colchester United) left footed shot from outside the box is just a bit too high. Dominic Vose (Colchester United) wins a free kick on the right wing. Foul by Josh Clarke (Brentford). Jabo Ibehre went off injured after Colchester United had used all subs. Sanchez Watt (Colchester United) wins a free kick in the defensive half. Foul by Clayton Donaldson (Brentford). Substitution, Brentford. Kevin O'Connor replaces Alan McCormack. Foul by Charlie Adams (Brentford). Jabo Ibehre (Colchester United) wins a free kick on the left wing. Substitution, Brentford. Josh Clarke replaces Nico Yennaris. Substitution, Colchester United. Dominic Vose replaces Alex Gilbey. Hand ball by Ryan Dickson (Colchester United). David Wright (Colchester United) wins a free kick in the attacking half. Corner, Brentford. Conceded by Sam Walker. Penalty saved! Alan Judge (Brentford) fails to capitalise on this great opportunity, right footed shot saved in the bottom left corner. Alex Gilbey (Colchester United) is shown the yellow card. Penalty conceded by Alex Gilbey (Colchester United) after a foul in the penalty area. Attempt missed. Jabo Ibehre (Colchester United) right footed shot from the centre of the box misses to the right. Substitution, Colchester United. Craig Eastmond replaces Freddie Sears. Alex Gilbey (Colchester United) wins a free kick on the left wing. Attempt saved. Sanchez Watt (Colchester United) left footed shot from the left side of the box is saved in the bottom right corner. Goal! Colchester United 4, Brentford 1. 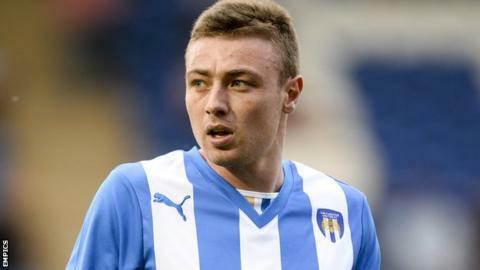 Freddie Sears (Colchester United) right footed shot from very close range to the bottom left corner. Charlie Adams (Brentford) wins a free kick in the defensive half.